The 4K picture quality (of Life) is unparalleled. Sharp and so well defined, each little drop of blood floating in space is amazingly detailed. Each tentacle on the alien organism is unique and it’s hideous “face” adds to the terror. The Dolby Atmos audio is also terrific and enhances ones viewing pleasure. For some reason, people worldwide seem to be fascinated by the idea of the possibility of life on other planets. We are always searching for proof of organisms in space to prove we are not alone and that other planets can sustain life. However, many theorize that if we did find aliens they may not be so welcoming and friendly as we hope. Hollywood has capitalized on this idea with numerous films about aliens invading Earth or destroying the planet. The latest in this grouping is a movie called Life. The International Space Station has been a home to scientists and astronauts from all over the world since 2000. It is a joint effort to live in and study space and all it offers so when a rover that has been on Mars is hurtling through space the team (made up of two Americans, two Brits, one Japanese individual and a Russian) on the ISS are tasked with "catching" it. Luckily they manage to do just that and unlock a treasure trove of samples. Among them are dirt samples that British Scientist Hugh Derry (Ariyon Bakare; Doctors) examines and discovers a single cell organism proving life on Mars. The seemingly innocent cell suddenly shows rapid growth but, after a malfunction in the ISS lab seems to completely shut down. In an effort to stimulate it, Derry uses electric shock to "wake it up" and succeeds. However, the organism, nicknamed "Calvin", then grabs a hold of Derry's hand, breaks it into pieces and escapes its enclosure while the rest of the crew watches on in horror. It is then, they realize it is not only highly intelligent but hostile and that is where their nightmare begins. The crew must then fight for their own survival while not allowing Calvin to reach the surface of the earth where they are sure it would destroy everyone and everything. Director Daniel Espinosa (Safe House) uses numerous techniques to draw viewers in including long, wide shots of a vast and complex space station. He shoots from various angles and gives the audience sweeping views of corridors making the set seem much larger than it actually was. His visuals are interesting and unique and he doesn't cut too quickly from scene to scene which allows one to fully embrace the environs. The cast is made up of seasoned actors who seem to gel nicely. Ryan Reynolds (Deadpool) and Jake Gyllenhaal (Southpaw) play the Americans while Rebecca Ferguson (Mission: Impossible – Rough Nation) joins Bakare as the other Brit in space. Hiroyuki Sanada (The Wolverine) is the Asian on board and Olga Dihovichnaya (House of Others) is the Russian commander of the vessel. I can't say one performance stood out more than any of the others which is actually a good thing in this case as they all seemed competent. Interestingly, Reynolds was originally supposed to be the lead male but was replaced by Gyllenhaal when he had a shooting schedule conflict with another film being released in August. I have said it before and I will say it again now - the 4K picture quality is unparalleled. Sharp and so well defined, each little drop of blood floating in space is amazingly detailed. Each tentacle on the alien organism is unique and it's hideous "face" adds to the terror. The Dolby Atmos audio is also terrific and enhances ones viewing pleasure. 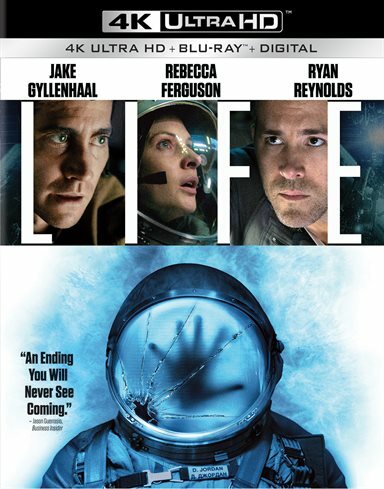 Labeled as a horror, sci-fi, thriller, Life is definitely categorized aptly. You can't help but feel your heart pound and your breath catch in your throat as you sit through the crew's ordeal and the blood spilled could certainly rival some of the great slasher films. The ending will send chills down your spine. While it starts off slow and ultimately is a reminder of Ridley Scott's 1979 classic, Alien, at times, Life is entertaining none the less. Be prepared to be scared. Download Life from the iTunes Store in Digial HD. For more information about Life visit the FlickDirect Movie Database.